The coconut palm—the long standing symbol for a relaxed beach vacation—is actually one of the most extraordinary trees on the planet. In the Philippines, the coconut tree is known as the “Tree of Life”. This may seem like a rather lofty name, but when you consider all of the diverse uses of this fruit bearing tree, we think it’s a fitting one. From root to frond, this is one of the most hardworking plants in history. Having the largest seed and the largest flower cluster, within the plant species, the coconut palm has made tropical living sustainable for years. 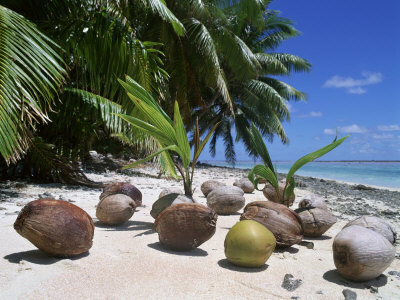 The seeds of the coconut palms, the coconut, wash ashore sandy beaches, implant themselves, and then start to mature and blossom after 5-7 years. The coconut palm will enjoy it’s fruit bearing years, for around a century. After a tree stops yielding the plentiful fruit, it will then be harvested for its leaves and trunks. 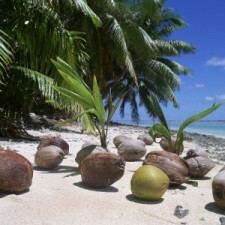 Coconut water, coconut milk, and coconut oil are all products of the coconut tree. The freshest, tastiest coconut water is found splashing around within the nut, when the coconut has matured to about 8 months. Nutritious and loaded with electrolytes, coconut water is enjoyed as a healthy and refreshing beverage. Wait a few more months, and the coconut has matured enough to extract the sweet milk and virgin oil from the coconut meat. Coconut milk, perfect for vegetable curries, is rich in taste and is used to create virgin coconut oil. Dried coconut meat is often used to make pastries, cakes, preserves, ice cream, and candies. The oil derived from dried coconut meat (copra) is used to make a wide variety of products, including cooking aids, cosmetics, soap, lotions, margarine, and more. Beyond food products, coconut tree leaves are woven together to create fans, hats, mats, brooms, baskets, thatched roofs, and more. The ribs of the leaves are used to make arrows, spears, and cooking skewers. Coir fibers are used to make entry mats, scrub-brushes, and other home necessities. The durable, weather-resistant wood from coconut tree trunks is used to build fences, boats, tables, small bridges, and more. Coconut oil has also been used in hairdressing and massaging.